Floyd Mayweather taunted Manny Pacquiao ahead of their eagerly-anticipated super-fight on Saturday, telling him he should be earning more money. The fight is the richest in history, with the fighters sharing around £150m, although the exact figure is unknown. However, the purse split is 60-40 in Mayweather's favour and the American legend said his Filipino rival had not been looked after properly. 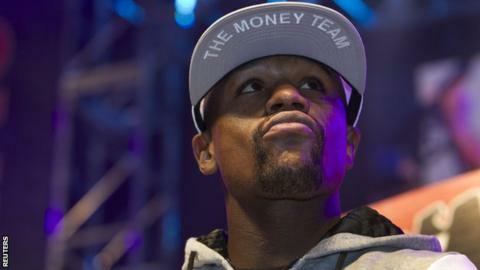 "If he'd have worked with us, he'd have made $100m (£65m)," said Mayweather. "Financially, he hasn't been treated right for this fight. And [this fight] is all about the money. "Saturday is just work, I'll just do what I do. But I'll make upwards of $200m for this fight, which is $50m apiece for my kids. So it was a smart move." Five-weight world champion Mayweather, nicknamed 'Money', came face to face with six-weight world champion Pacquaio for the first time at a Miami Heat basketball game in January. The 38-year-old American said he instigated the initial meeting in Pacquiao's Miami hotel suite - which Mayweather said was not up to his exacting standards. Mayweather, who is unbeaten in 47 professional fights, explained: "I went over to Manny and said: 'I don't know what [Pacquiao's promoter] Bob Arum is saying to you, but it's not true. "When Manny Pacquiao said he had signed paperwork to fight me, he must have been signing half of his money away. He hadn't signed to fight me. "I told him that if we agree to drugs testing and we're on a level playing field, we can make the fight happen. The fight came about because of me. "But why did they have him staying in that type of hotel? It wasn't right." Mayweather also reiterated his intention to retire after one more fight in September, even though two more victories would leave him equal with heavyweight legend Rocky Marciano's 49-fight unbeaten record. "People ask me about Rocky Marciano's record but it's time for me to walk away. And I won't miss boxing," said Mayweather. "The money is more important than any unbeaten record - my daughters can't eat no 'zero'. "Getting to 50 fights unbeaten might be special for you, but for me it's not."